This article by Vichitra Nades and Chua Sue-Ann first appeared in #edGY, a section of The Edge Malaysia, on 1-7 June 2015. More young lawyers are striking out on their own, setting up small law firms instead of waiting years to climb the career ladder. We explore why and how the legal service industry is changing together with technology, and the way business is done. THESE days, many young people seem to aspire to be entrepreneurs. This desire to start a business or “be your own boss” applies to those in the legal industry as well. Yes, it’s true that lawyers starting up their own firms is nothing new. Malaysia’s legal services sector — comprising thousands of small, medium and large firms — sees the opening of new practices all the time. Numbers from the Malaysian Bar, which regulates the legal profession in Peninsular Malaysia, show that there are 5,101 legal firms in the peninsula and 4,554 of these, or almost 90%, are small practices with five or less lawyers. There are only 30 large legal firms with more than 30 lawyers, and 517 firms with 6 to 30 lawyers. The Malaysian Bar does not keep data on the age of owners of new legal firms. But young lawyers Marcus van Geyzel and Joanne Leong are among those who see a noticeable shift in the industry in recent years. Senior lawyer Datuk CV Prabhakaran agrees, saying that it is common for practising lawyers to start their own firms. “The legal industry is very competitive nowadays,” says Prabhakaran of Prabha & Associates. The cover of edGY, 1-7 June 2015. Van Geyzel had previously worked in medium-sized firms for 10 years before starting Peter Ling & van Geyzel in January 2013 with his partner. Leong, meanwhile, spent about five years being a salaried lawyer before striking out on her own with her partner recently to set up Yeoh & Joanne. 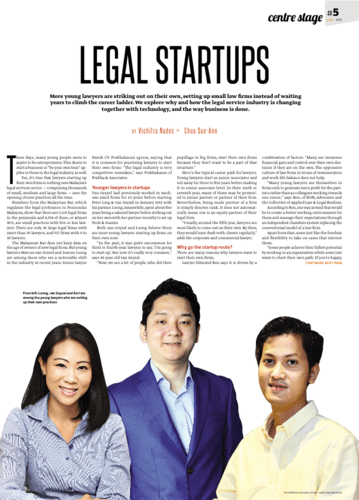 Both van Geyzel and Leong believe there are more young lawyers starting up firms on their own now. “In the past, it was quite uncommon for third or fourth-year lawyers to say, ‘I’m going to start up’. But now it’s really very common,” says 34-year-old van Geyzel. Here’s the typical career path for lawyers. Young lawyers start as junior associates and toil away for three to five years before making it to senior associate level. In their sixth or seventh year, many of them may be promoted to junior partner or partner of their firm. Nevertheless, being made partner of a firm is simply denotes rank. It does not automatically mean one is an equity partner of their legal firm. “Usually, around the fifth year, lawyers are most likely to come out on their own. By then, they would have dealt with clients regularly,” adds the corporate and commercial lawyer. Why go the startup route? There are many reasons why lawyers want to start their own firms. Lawyer Edmund Bon says it is driven by a combination of factors. “Many see immense financial gain and control over their own destinies if they are on the own. The oppressive culture of law firms in terms of remuneration and work-life balance does not help. “Many young lawyers see themselves in firms only to generate more profit for the partners rather than as colleagues working towards one vision,” says Bon, of BON, Advocates and the Collective of Applied Law & Legal Realism. According to Bon, one way around that would be to create a better working environment for them and manage their expectations through an independent chambers system replacing the conventional model of a law firm. Apart from that, some just like the freedom and flexibility to take on cases that interest them. “Some people achieve their fullest potential by working in an organisation while some just want to chart their own path. If you’re happy, then stay where you are,” says Azri Malek, who set up his one-man firm eight months ago. Azri decided to be his own boss simply because he wanted more control over his personal time to do voluntary work and be involved in social activism, which he is passionate about. “I’m not against big employers. But if I’m on my own, I can arrange my schedule accordingly. This gives me freedom,” he says. Leaving is as much a personal choice as a business decision. For van Geyzel, it was a business decision — he saw a gap between the business he was bringing in to his old firm and his pay package. This is all part of a big shift in culture that is slowly but surely sweeping through the legal industry, which had — for the longest time — been very traditional. “The bigger firms are really traditional in the way they think about business. They see all this ‘work-life balance’ as an American thing that doesn’t apply to us. “Now, you’ll find more and more law graduates coming out and expecting meaning in what they do and thinking about the values in their workplace,” says van Geyzel. 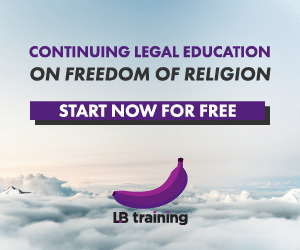 Another noticeable change that Bon observes is that some lawyers are no longer seeing themselves are purely lawyers, but are positioning themselves as “community service providers” with law being one of the tools to solve some problems. “Understanding politics, human rights, business, trade and so on are things we do not learn in law school but have become increasingly important if we want to effectively ply the trade,” Bon says. The story as it appeared in The Edge. Why is this possible now? These days, there is a higher chance of startups surviving and thriving. It’s due to a combination of factors. Van Geyzel attributes it to the change in the way business is done, which he believes also affects how legal services are offered. Technology is one big factor. “Technology has changed the way businesses work. A lot of clients are mobile or don’t insist on meeting in an office. They’re even okay with meeting in a café as opposed to the old-school clients we used to have, who probably wouldn’t agree to meet at Starbucks,” he says. In the same vein, Puspha Ratnam points out that with technology, the delivery of service has to be fast. “Technology today has changed the way legal firms operate. We correspond with clients through email. Documents are filed from the comfort of the office using e-filing system. Documents are sometimes served via email. Clients bank in money via online banking. The delivery of service has to be fast. Some legal firms deliver and receive documents via e mail,” says Pushpa, a partner at Hakem Arabi & Associates. The second reason is the clients’ changing demands — they want more personalised service for a better price. “The reason for the shift is fees are very high and there is no personalised service from the partner. So, people are moving away from big law firms,” says van Geyzel. At a big legal firm, more likely than not, the person handling a case would be the junior lawyer. The senior partner who brings in the deal just plays a supervisory role. “In the legal industry, it’s very much the person you are dealing with rather than the firm,” van Geyzel explains. That’s not to say that the larger legal firms are irrelevant — far from that. Large companies or deals still require the services of the big-name firms. But often, work is parcelled out to the smaller firms. “There’s no longer the stigma that small firms can’t do big deals,” van Geyzel says. Do smaller firms need to compete with big firms? Not quite. Leong says there are enough cases to go around. Different firms also specialise in different areas of law. While lawyers are prohibited from advertising their services directly to clients, the internet has levelled the playing field, says van Geyzel. “Previously, for small firms, it was impossible to compete. The only way you’d find out about small or medium law firms is if you heard about a particular firm from someone. How do legal startups survive? 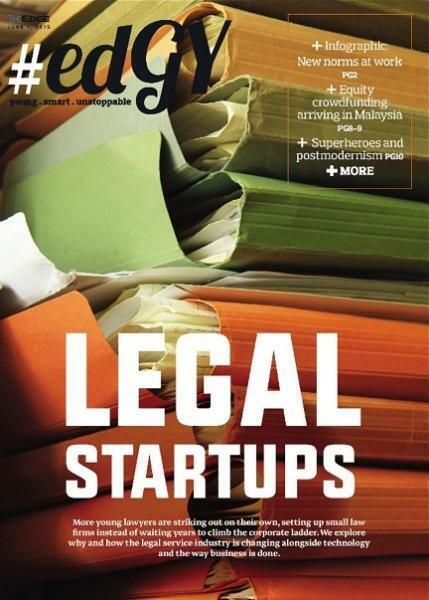 Azri believes there are more startups in the legal services industry compared with other professions because of the former’s lower startup cost and low barriers to entry. It costs a whole lot more for doctors and dentists to set up shop, for example. In the initial stage, a new law firm’s startup cost mainly comprises registration with the Bar, rent and overheads as well as staff costs. Most start small to manage staff costs, and only scale up once the cases start to pile up. “For lawyers, starting is easy but sustaining [the business] is the challenge. You have to get a steady income from your clients, and understand that the first few months might be difficult. You have to take what you can,” says Azri. But why do legal firms fail? Like other types of businesses in the service industry, it boils down to managing your overheads and cash flow. Leong’s firm, for example, comprises her and her partner Yeoh Tung Seng. They have yet to hire any other lawyer or administrative staff but plan to do so slowly once the case load increases. “You must prepare yourself for the possibility of going through months without clients,” Azri says. There are months when he has no clients and months when he has enough. To be sure, the hierarchical system still applies in the old firms. “The waiting game, scaled salary, fixed years of promotion — it’s all still there. They (the bigger firms) don’t believe in flexible hours, that sort of thing,” says van Geyzel. Posted on 10 June 2015. You can follow any responses to this entry through the RSS 2.0. WOOOOOW !! Pretty interesting post. A must read one. every young lawyer must have to join a law firm for the better chance to change his working life. in the 21st century working alone is not getting success overall. working with a community can increase the chance to getting success. most inspiring post is this.